I did not remember this episode, like at all, so I guess it's fairly forgettable. Though a man being childishly unable to talk a woman he likes does result in deaths, so there's that. Hannah, a woman in Utah, is blamed for a fatal explosion at the factory where she's safety inspector. Weird stuff happens around her, inanimate objects moving on their own. Facing the rage of her community she blames herself and thinks she's being haunted by demons. Coulson's team go in to find out if Hannah has abilities. Things get heated with the townsfolk and though Coulson tries to keep things calm May tranqs Hannah and she's kept in the interrogation room for safety. Skye objects to how Hannah is being treated and argues for a friendlier approach, she's especially scornful of May. Fitz and Simmons try to prank Skye because she's the newbie so they talk up May's reputation as 'the Cavalry'. Spooky stuff happens on the plane as a man flickers in and out trying to attack the team, and then sabotaging the plane, forcing an emergency landing. He's Tobias, one of the men killed in the explosion. May takes Hannah out of the plane and draws Tobias out. He was killed in the accident and although the team thought he disliked Hannah Skye realises he probably had a crush on her. May convinces him they aren't harming Hannah and tells him he has to let her go. Coulson tells Skye she could be really good at dealing with newly powered people and tells her to lay off May because she went through a lot and it changed her. Coulson asks Skye to pay close attention to their mission as he thinks it's the kind of thing she'd be good at. Given her approach to Mike Peterson that makes sense. Though he's sees Skye's reasoning Coulson still plays things mostly by the book, using May and Ward as they're his senior agents. He's upfront with Hannah, having May explain why she shot her. He tells Skye the truth about May, not the details of what happened, but how it affected her and how she was changed. Coulson's impressed that Skye could put Hannah at ease and figured out Tobias's motives. May gets more character development here than she has before. Ignoring Ward's plan for how to return to the plane May goes off and does her own thing; she then reprimands him for showing up late. In Utah as things get heated she shoots first, knocking Hannah out with a tranq gun before she or anyone else is hurt. May manages to land the plane, with some help from Ward, after it's been its been sabotaged. It's a rough landing in what appears to be woodland, no easy feat to get them all down safely. There's much discussion of how May was called 'the Cavalry' the assumption seems to be that it was something violent and badass, but May resists the nickname and any kind of glory for what we learn was actually a harrowing situation. May figures out Tobias, possibly before Skye, but she goes off on her own with Hannah to save the rest of the team. After trying to fight a bamfing ghost May talks him down, getting Hannah to convince him she's safe, and pointing out that his actions are the main thing harming Hannah now. The words May uses on Tobias are the same ones Coulson told her after the incident. Before the incident Coulson tells Skye that May was warmer. Ward strategically plans returning to the plane, but while he's explaining this she just leaves. I kind like that she makes Ward look chatty. Skye complains about May to Ward, believing what Fitz and Simmons said and disapproving of May's coldness and suspicion towards her. Ward only kind of defends her and still repeats the rumour in a way May wouldn't like, though he at least points out that she's a professional and doesn't do things for the glory. Ward tries to fight Tobias, but it's hard to fight well against an opponent that can become insubstantial and teleport. While talking about the impossibility of telekinesis Simmons recalls a prank played on them when they were freshman at the Academy. Fitz regrets that they both graduated early and didn't get to pull any pranks themselves, then they realise that Skye is the equivalent of a freshman and they should prank her. It's a cute subplot, but isn't as endearing or inventive as it could be. These two are literally geniuses and their best ideas are adding a ridiculous detail to a preexisting rumour and rigging up a mask and mop to fall out of a cupboard. 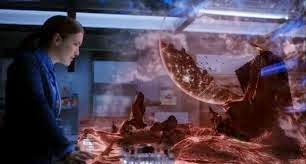 Simmons finds the image of another world in the recreation of the explosion, the assumption is that it was caused/affected by the events of Thor 2. The after-credit bit is fun. Skye's empathy and concern for people, as well as her ability to read them, is why Coulson wants her to watch the Index Analysis, and her non-institutional background is why she suggests the process should be called the 'welcome wagon'. Skye's anger at May is understandable as the agent has always treated her as an outsider, and it's only compounded by what Skye sees as May's lack of concern for Hannah. Skye looks Hannah up online and discovers what a caring, compassionate and lovely person she is, coupled with her faith this leaves Hannah emotionally tormented by the idea that she might have caused an accident. Skye is supposed to be observing only, but she goes to comfort Hannah and after May convinces Tobias to go it is Skye who hugs Hannah. Skye figures out that Tobias doesn't hate Hannah, quite the reverse, he was causing accidents so she would come and visit, it's because he's childish and couldn't just talk to her like a regular person. A man causes an explosion in a particle accelerator and this opens a portal to an alien world (or Hell, or mayve Hel). The suggestion is that it's to do with the inter-dimensional gravity weirdness from Thor 2, but the connection is far from strong. It's also odd that Tobias seems to be alive and able to jump between worlds and be invisible or intangible at will and no one wants to study that. After convincing him not to be creepy and murdery did no one want to figure out how the effect happened? Also I'm not clear if he was dead or just stuck on the other planet. I got that he was meant to be in and out of phase with Earth, but this wasn't explored well. Tobias, kind of. I feel that maybe he should have noticed how badly the stuff he was doing affected Hannah. And even if he thought he was defending or protecting her that doesn't excuse trying to kill people. Lucky escape for Hannah I think, that guy was obviously trouble. "I didn't go to your stupid Shield Hogwarts or whatever." Skye to FitzSimmons when they talk about the Academy. Trying to avoid the ghostly assailant Fitz is completely terrified by his own silly prank. "Obviously I set this little beauty up before I knew there was a dimension-jumping psychopath in the mix." After credits scene is funny. I love Simmons claiming the English language (she's the only one there who can in that way) and then using her Britishness against them. It's amazing, as long as you aren't y'know colonising people, that's bad and we mostly know that now. Fitz's entrance and the the reveal of May's sly smile as she listens from the cockpit are great. Not much that relates to future episodes or the wider MCU here, which may be why I didn't remember this very well.